Karen Kortz has been teaching introductory geoscience courses at the Community College of Rhode Island for over 10 years. She has a passion for teaching, as evidence by receiving several teaching awards from her school and the Biggs Award for Excellence in Earth Science Teaching in 2008. Karen's research field is geoscience education research, and she is an Associate Editor for the Journal of Geoscience Education. Karen is also passionate about sharing research findings about effective teaching. She has lead multiple workshops, has authored the books Lecture Tutorials for Geoscience and Lecture Tutorials for Earth Science, and is currently working on an introductory geology textbook. 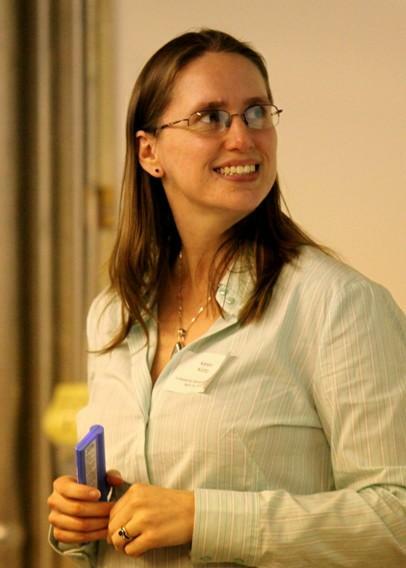 Karen was nominated to be a GSA Fellow in 2014. For a full cv, please visit her webpage http://faculty.ccri.edu/kkortz/index.shtml. This Lecture Tutorial worksheet guides students through thinking about the effects humans have on infiltration, and how that effects the duration and severity of floods. It is designed to be used in groups after a brief lecture introducing surface and ground water flow into a stream. Students work on this Lecture Tutorial worksheet on ocean crust ages in groups during lecture. It directly confronts misconceptions students have about the patterns of ages of the ocean crust, and interpretations that can be made. This Lecture Tutorial worksheet is designed for students to work on in groups after the students have learned about basic surface features and how they relate to planets in general. The tutorial is designed to help students look at these simple features and realize that they are not independent features, but instead are related to the planet as a whole. The design of this short Lecture Tutorial worksheet allows students to make predictions of what rock types they would expect to find on other planets. After a brief lecture, students work in groups to answer the questions to help them understand the conditions of formation for the three rock types. After a short lecture, groups of students complete this Lecture Tutorial worksheet on the different hypotheses of the function of Stegosaurus plates. The worksheet is designed so students examine different lines of evidence, and they must choose the best interpretation(s). A lifelong skill is for students to think about their learning, or be metacognitive about it. Although metacognition ties directly to student success, it is often not taught, and it is a skill that many two-year college students lack. One of my goals is to purposefully structure my courses to help students focus on and be more aware of their own learning.